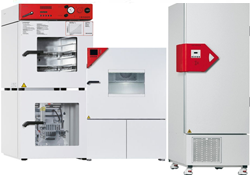 At BINDER, you do not just get a CO2 incubator, material test chamber or cooled incubator. At BINDER, you get the exact chamber you need for your application in the laboratory. Granted, we love details. We develop complex ventilization systems, which even when fully loaded result in completely homogeneous climate conditions for virtually any sample. Or we make your chamber independent of water supply and installation site. Whether a climate chamber with illumination, temperature test chamber, ultra low temperature freezer or heating oven: We guarantee you the best conditions for your success in science and industry.